Well, its been a while since I have had a chance to even think about blogging. 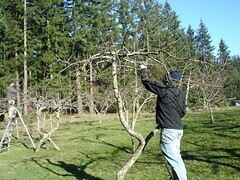 I am currently in-between projects and it has been a great time to catchup on getting my development environment up-to-date, test out some new ideas, and of course prune the orchard! Spring is here and with over 70 trees to get in shape much of the next couple of months will be on a ladder. Another development in the works is trying to start 2 bee hives in the orchard this year. I have been starting to dive back into QGIS and plugin development. There are some really cool things on the horizon and I will be posting about some of the things I am looking at over the next couple of weeks. Of particular interest to me is the new WebKit integration to QT that happened at QT version 4.4+.